‘Sathya’ is the official remake of Telugu hit ‘Kshanam’ which had Adivi Sesh, Adah Sharma and Anasuya Bharadwaj playing the lead roles. Actor Sibi Sathyaraj has mostly featured in films which have been formulaic and mostly mainstream. His latest film is ‘Sathya’, a thriller, is directed by Pradeep Krishnamoorthi and also stars Remya Nambeesan, Varalaxmi Sarathkumar and Sathish in pivotal roles. ‘Sathya’ is the official remake of Telugu hit ‘Kshanam’ which had Adivi Sesh, Adah Sharma and Anasuya Bharadwaj playing the lead roles. Sathya it sreens on December 8th, 2017 worldwide and has been receiving encouraging feedback from audiences and critics as well all around. Day 1 of release of ‘Sathya’ saw the box office clock some decent numbers. The first day box office report of ‘Sathya’ will surely bring a smile on the makers of ‘Sathya’. ‘Sathya’ movie earned approximately INR 0.46 crores in Chennai city alone and the rest of Tamil Nadu has collected approximately INR 0.37 crores, according to reports. Further numbers of collections of Sathya are yet to be reported by the makers of the film. The original Telugu film ‘Kshanam’ was a surprise hit when released and the film earned collections of approximately INR 0.80 crores. The makers of ‘Sathya’ had recently released the trailer of the film which received a positive response from all around including critics. 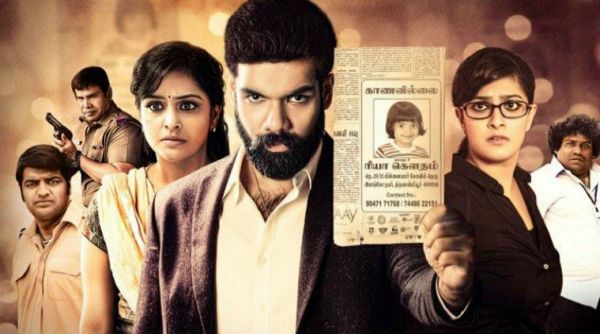 Apart from the intriguing sequences, the trailer also gives us a sneak-peak into the chemistry between the lead actors Sibi Sathyaraj and Varalaxmi. The action sequences, the crisp dialogues, and the background music give us an indication that this will be a film to watch out for. ‘Kshanam’ was a super hit film in Telugu and the makers of the Tamil remake are expecting the remake to achieve a similar success. Ahead of the release of the film, the makers have a released a 4-minute long clipping from ‘Sathya’ which gives a sneak peek into the film. The video starts with a conversation between Remya Nambeesan and Sibi Sathyaraj where she seeks his help and narrates to him what had happened with her in life. The video ends on the note where Remya tells Sibi that her daughter was abducted and she needs his help in that matter since he is a cop. This had raised the expectations on the film and the eagerness to watch the film on release day was high since it is a thriller. Sibi Sathyaraj was last seen in ‘Kattappavae Kaanom’ which was directed by Manu Seiyon and also stared Aishwarya Rajesh in the lead role. The film was released in March this year and received a decent opening. However, the film couldn’t sustain it for more than a week at the theatres. And with Sathya, Sibi Sathyaraj takes his career one level up much to his joy. In Sathya, Remya Nambeesan plays the role played by Adah Sharma in the original and Remya is being appreciated for her performance in the role. Remya has also sang a song in Sathya which is made as a cover song for the film. Composed by Simone K. King, the song is originally sung by Kalyani Nair and Yasin Nazir, and is already a hit number. The latest cover version, sung by Remya Nambeesan, was released by Tamil actor RJ Balaji on social media today evening. Speaking to a leading daily, Remya had revealed what mad her croon that song and why the makers were convinced to make a cover version for it. “When I listened to the song for the first time, I liked it so much that I wanted to try in my own voice. So, I took it up to Sibi(raj) and Simone K. King, the composer of the film. Then we had a jamming session at his studio, and eventually came up with the cover,” Remya had said. Varalaxmi Sarathkumar plays a cop in Sathya which was portrayed by Anasuya Bharadwaj in the original version. Varalaxmi is being lauded for her performance in the film from audiences and reviewers all around. Varalaxmi, since the beginning of her career, has been choosing roles which are realistic and are offbeat. And with Sathya, she adds another feather to her hat. With everything their way, the makers and the cast of Sathya would be an elated bunch and will be soaking in the success of the film.